Scott Kelly has passed the record for the most cumulative days spent in space by a NASA astronaut (382 days and counting). He is scheduled to log a total 522 days off the Earth. A NASA astronaut has set a new record for the most time spent off the Earth by an American citizen. 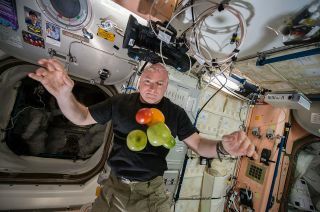 On Tuesday (Oct. 13), Scott Kelly, who is currently serving as commander of the International Space Station's Expedition 45 crew, marked the 200th day of what is scheduled to be a 342-day mission on board the orbiting outpost. Two days later, he passed the previous record for the most total cumulative time spent in space by a U.S. astronaut of 381 days, 15 hours and 11 minutes, including the 180 days on his previous three missions. Kelly is the first American to spend nearly a year in space on a single mission. Together with Roscosmos cosmonaut Mikhail Kornienko, who's also spending 12 months in orbit, Kelly is collecting medical data to support future astronaut missions beyond the Earth to the asteroids and Mars. "Records are meant to be broken. Look forward to one of my colleagues surpassing [mine] on our Journey to Mars!" Kelly wrote on Twitter on Friday (Oct. 16). Kelly will set another duration record later this month. U.S. astronaut cumulative days in space record holders. On Oct. 29, just 5 days shy of the 15th anniversary of the first crew taking up residency on the International Space Station, Kelly will log his 216th day on board the complex, surpassing the previous record for the single longest flight by a United States astronaut of 215 days set by Michael Lopez-Alegria as commander of the Expedition 14 crew in April 2007. It will be the first time that an astronaut has held both the single mission and cumulative time in space records since Expedition 4 flight engineer Carl Walz in 2002, who totaled 196 and 230 days, respectively. Kelly's durations records though, fall short of claiming the title for worldwide spaceflight veterans. Soviet-era cosmonaut Valery Polyakov logged the longest space mission in history 20 years ago. The first person to spend a continuous full year in space, Polyakov lived and worked on Russia's former space station Mir from January 1994 to March 1995, recording 437 days, 17 hours, and 58 minutes in flight. But even that record pales in comparison to Kelly's former crewmate, Gennady Padalka, who just last month set the new bar for cumulative time logged in spaceat 878 days, 11 hours, and 31 minutes. The cosmonaut accomplished that feat at the end of his fifth mission, which began as he launched to the space station with Kelly and Kornienko in March of this year. Kelly is scheduled to return to Earth on March 3, 2016, by which time he will have 522 total days living in space. Kelly's place in the history books also includes an entry unrelated to how long he has orbited the Earth. Together with his brother Mark, they are the first-ever twins to both be astronauts. Mark Kelly, who logged 54 days on his four shuttle missions (including Endeavour's final mission with Fincke) is participating from the ground in parallel studies with Scott to help compare the effects on the human body and mind in space. Watch a video about astronaut Scott Kelly and his year-long mission at collectSPACE.com.